The celestial markings on Pillar 43 at Göbekli Tepe are indeed intriguing, but there is more: Those pesky purses decorating the top of the pillar. In his book Magicians of the Gods, Graham Hancock points these out along with similar purses or containers from Mesopotamia and Mexico. In both examples look at the shape of the purses and at how they are held –are they too similar to be coincidence? The story of gods or demigods who brought civilizing skills to more primitive people (thus jump-starting more advanced civilizations) is a common one. We see it across the globe, most often associated with a flood or deluge that almost wiped out life on the planet. So I did a search. Most of the civilizing gods we know, Thoth who became Hermes, Osiris, Rama from India, Virachoca, and Kulkulkan both from South America, do not carry purses. But I found two others who did. So what’s with those pesky purses anyway? According to esoteric tradition, what The Fool carries in his purse is memory, in this case cosmic or universal memory as he steps from Kether, the Beginning (or Crown), to Chokmah, which represents Wisdom, on his journey down the Qabalistic Tree of Life. If you are not familiar with the Qabalah, don’t spend a lot of time working that out–the point is the Fool is just beginning a long journey and he is taking the memory of his past with him. Much like the sages of old who brought civilizing skills to the hunter-gatherer peoples in Mesopotamia, Egypt, the Americas, and other parts of the world. 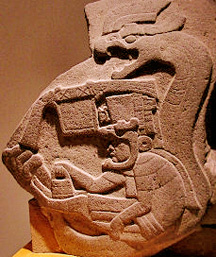 So one way to see the purse is as the container for the wisdom and knowledge of the lost civilization. Trunks of manuscripts come to mind, and lost halls of records under pyramids, but also technology like the Ark of the Covenant, or even Arks that are boats carrying people away from lands sunken by the great deluge. They all contain the memory in one form or another. And let us not forget the beings themselves for they, too, are containers of that knowledge. The seven sages of Mesopotamia, the seven sages on the Edfu texts, all the civilizing “gods” fit this description. And finally, as I was pounding away on the treadmill this morning, I had one other thought: The memory is also contained in what Jung termed the Collective Unconscious, and that, too, is a sort of purse or container of wisdom. One we have access to today. So my search for these ancient purses continues–are there perhaps other clues out there? Please comment if you know of any. Whoa! That’s really interesting! This hits a chord of recognition! Ah, yes…the chords all tie (or knit) together in the end. This must be why Queen Elizabeth is never seen without her purse. After all, why the heck else does she need a purse? If we could solve the mystery of what is in her purse, perhaps we could solve this riddle of the ages. Sorry. Couldn’t resist. Great fun to read about all this. Hey, John Dee’s influence? U never know.